Fun Fact: Visit their website for a free dessert coupon. Menu Highlight: Known for their smoked BBQ, the sampler is a great way to try the ribs, pork and brisket. 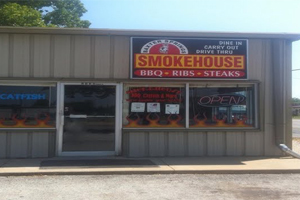 Established in December of 2006, have been serving the 4 states area with the best smoked meats, steaks and seafood around. Stop by today or call ahead and place an order to go and pick up through our drive-thru. Open 11:00 am to 8:00 pm Monday through Friday and 7:00 am to 8:00 pm Saturday & Sunday. Fun Fact: Bring your laptop or iPad because you’ll have access to free Wi-Fi. Menu Highlight: A popular candy of theirs is the Mine Run candy. This crunchy, sponge-looking candy was invented by accident when Joe Anthony tried to make peanut brittle. Steve’s Candy makes daily batches of Mine Run candy, a favorite of the four states. Also have English Toffee, Clusters, Handmade Marshmallows (hand dipped), Heavenly Hash, Turtles, Chocolate or Peanut Butter Fudge, Peanut Butter Balls and Divinity. Fun Fact: Outside the gas station/grill is Tow Tater, the inspiration for Tow Mater from the Cars movies. He can be rented for events. Menu Highlight: They have a variety of smoothies with creative names such as School Bus Breakfast, Honeymooner’s Tonic and Grape Escape. 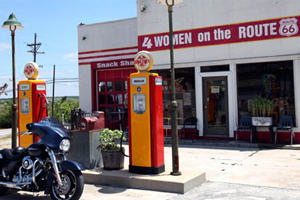 The old Kan-O-Tex service station at the north end of Main Street in Galena, Kansas has been purchased by 4 women from Galena: Betty Courtney, Melba Rigg, Renee Charles and Judy Courtney. They are helping lead the rebirth of Galena’s stretch of Historic Route 66. But this Kan-O-Tex service station is now restored. They sell sandwiches, snacks, antiques, Route 66 and Car’s items, including several made by local craftspeople and artists. Outside the building there will be several vehicles, including the mining boom truck that inspired the character “Tow Mater” in Radiator Springs from the movie Cars. For trademark reasons, Four Women are calling their boom truck “Tow Tater.” Tow Tater still runs and can be hired to appear at special events. 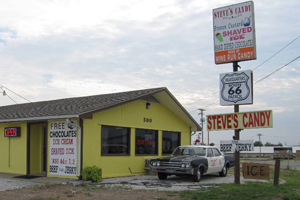 The Eisler Brothers Old Riverton Store in Riverton, Kansas has been operating along Historic Route 66 since before the Route officially opened. 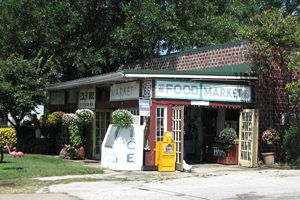 It was built by Leo Williams in 1925 and he operated the market as Williams Store until 1973 when Joe and Isabell Eisler purchased the business. Today Eisler Bros. sells groceries, produce, flowers, Deli meats & cheeses, gifts, Route 66 memorabilia and local handicrafts. It is a popular stop for travelers cruising Route 66. Stop and purchase a sandwich and get a cold pop out of an original Coca Cola cooler. One of the original out houses is still sitting behind the Eisler Bros. Store.